It’s no secret that I love all of Caroline Smaile’s books. Each one of them is so different, so incredible, that each book has stayed with me long after I’ve read it. Her new novel, 99 Reasons Why, is no different. In 99 Reasons Why, we meet Kate Jones. Kate isn’t like other twenty two year olds. She lives with her mother and her father and has a very important job to do for her Uncle Phil. She sits in her window every day and observes the goings on at the Kevin Keegan Day Nursery. Every day she writes down the comings and goings of the nursery in her notebooks. One of the children, a little girl in a pink coat, catches Kate’s eye. She wants the little girl for herself. It’s when her mother and her Uncle Phil begin to make plans to steal the little girl in the pink coat for Kate that things begin to go awry. The little girl in the pink coat’s father, Andy Douglas, has caught Kate’s eye as well and she wants him badly, even though her past experiences with love haven’t turned out so well. Then there’s the fact that she is Princess Diana’s daughter, her father is driving an illegal taxi, her mother is sleeping with Uncle Phil and she will soon have her very own child. It’s a lot for a girl like Kate to keep inside. Sometimes she feels as if her head will burst with all the secrets that she must keep. However, even the most feared secrets will find their way out of the darkness and into the light. 99 Reasons Why is an absolutely amazing read from start to finish. Caroline Smailes has penned an incredible story with one of the most fascinating characters ever to grace the printed page. Except, 99 Reasons Why is a novel with a difference. There are eleven endings to 99 Reasons Why. Nine are included in the eBook and you get to choose your own ending to Kate’s story. If you read the book on your Kindle, you will be asked a series of questions to determine which of the nine different endings you will read. If you’ve got an iPad (like I do), you get to spin a wheel and leave your ending up to chance. This would be a great gimmick if the writing wasn’t so amazing. 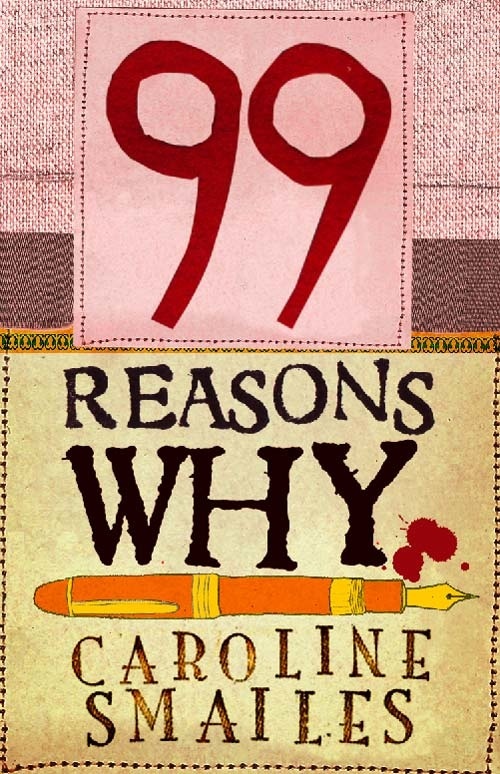 Caroline gets better with every novel and 99 Reasons Why is her best yet. Even without the interactive feature of the eBook, it’s an amazing, heart breaking, harrowing read. It’s also quite funny in parts, which gives the book an incredible amount of depth. There is every emotion in the novel’s pages and when you finish reading, Kate will stay with you as will Caroline’s incredible writing. She has a way of making the mundane seem extraordinary. Combine all that with the interactive part of the eBook and you have something that is beyond incredible. Kate is not an ordinary girl, 99 Reasons Why isn’t your ordinary kind of eBook it succeeds on every level. What I love most about the book were the characters and their story. Caroline writes it so well its as if we’re right there with Kate, going along for the ride. The novel pulls you in from the first page and doesn’t let you go until you finish it. After I read the first ending (I got number 3 on my first go), I went back and read all the others. In short, 99 Reasons Why is incredibly brilliant in every possible way. It’s a fantastic story told in a revolutionary way. I started the novel on a Friday night and was done by Saturday. 99 Reasons Why is so good that I’m already half way through it for the second time. Make no mistake: this is a dark thrill ride of a novel that will leave you with a jaw dropping ending (or a few of them) and Kate will stay with you long after you’ve finished 99 Reasons Why. That’s the power of a true storyteller and its something Caroline Smailes has in spades. Deft, funny, haunting and harrowing, 99 Reasons Why is amazing 99 times over.